After consultation, much discussion, and agreement with the Clerk Craft Director, the APWU has decided that the money will be distributed in equal amounts to clerk craft employees who fall into two categories (click below to read more). 02/27/2019 - There are a few ways in which a local union or state organization can update members’ addresses. 02/27/2019 - No one wants to pay double dues when they transfer to one of the crafts represented by the APWU and join our union. 02/26/2019 - Local and state presidents can pull and print a list of members or non-members for their organization by logging into the Members Only section of the website. A copy of the list can also be e-mailed to a local or state president by requesting one from the Per Capita Department. Requests should be directed to Anna Smith, Director, Organization Department in writing at organization@apwu.org or American Postal Workers Union, Attn: Organization Department, 1300 L Street, NW, Washington, DC 20005. All requests will be sent in Excel (.xlsx) or PDF. 02/20/2019 - On Feb. 19, almost a year after walking out of school and beginning a national movement of teacher and education workers strikes across the country, West Virginia workers struck again. This time teachers and school personnel walked out explicitly in protest against a potential bill that would begin a process to privatize the state’s education system. Schools in 54 of the state’s 55 counties were closed for the day, and the House of Delegates voted 53-45 to kill the bill only hours after the walk out. 02/19/2019 - On Feb. 13, Sen. Bernie Sanders (I-VT) introduced S. 478, the “Expand Social Security Act,” legislation that would expand benefits and add almost 50 years of solvency to the program. Social Security, in its current form, is paying out more money to recipients than it takes in, and will no longer be able to pay out full benefits by 2034. A companion bill, H.R. 1170 was introduced in the House on the same day by Rep. Peter DeFazio (D-OR-4). 02/19/2019 - On Feb. 15, 2019, the APWU National Executive Board adopted a proclamation honoring women of the APWU throughout March, in celebration of Women's History Month. 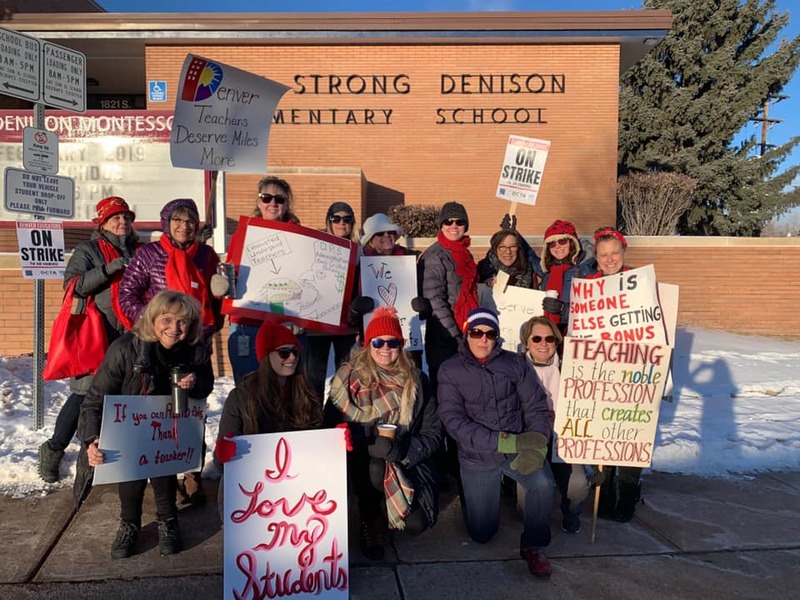 02/13/2019 - On Monday, Feb. 11, over two thousand educators from the Denver Classroom Teachers Association (DCTA) walked out of school, launching the first teachers’ strike in the city in over 25 years. The walkout follows 15 months of negotiations. The strike vote passed in January with over 93 percent of the workers in favor of the walkout. The APWU National encourages members who are able to join the picket lines or show their support via social media with the hashtag #DCTAstrong. You can also donate to the strike fund.